What an easy, fast dish!! The greatest amount of time is consumed chopping the pepper, onion and chicken. Super fast!! This is great on it’s own (as I had it) or over rice. This will definately be made again soon. Combine the first 6 ingredients, whisk to combine and set aside. Heat a large wok or large heavy skillet over medium-high heat and add 1 tbsp oil to the pan and swirl to coat. Add the chicken and stir-fry for 4 minutes or until browned and done. Remove the chicken and add the other 1 tbsp oil to the wok and swirl to coat. Add the peas, pepper and onion and stir-fry until crisp-tender about 3 minutes. Stir in te brown sugar mixture and cook 1 minute or until thickened. Stir in chicken, toss to coat. Sprinkle with green onion and peanuts. Adapted from Cooking Light Magazine, September 2012 issue. Makes 4 servings (without rice). Prep time: 10 minutes Cooking time : 15 minutes. 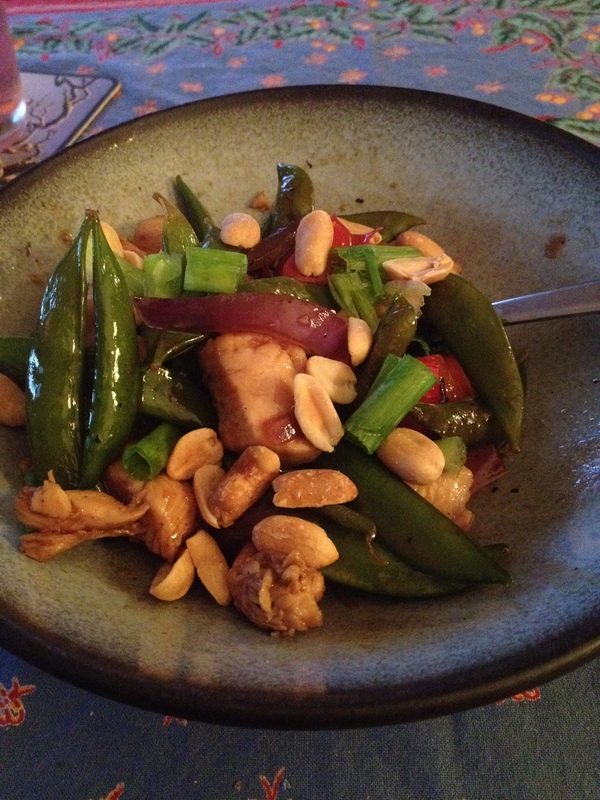 Last night I felt like making an easy stir-fry. I didn’t have the recipe at work that I normally make so I found Kikkoman’s on allrecipies.com and changed it up a bit. I intended to make it just like the recipie until I got to the store and saw that sugar snap peas were on sale, so I bought some of those. And then I started thinking I wanted to add some color so I picked up a red pepper too. So here’s what it ended up being. I was told by my husband that he ‘likes the ratio of ingredients-not too much or too little of anything’. Thanks Kev!! Heat 1 tbsp oil in hot wok over med-high heat. 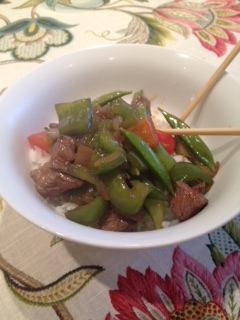 Add beef and stir-fry about 1 minute (or until almost cooked to your desired temp). Set aside. Heat remaining tbsp oil in the same pan. Add peppers, peas and onions, splashes of soy and fish sauce and stir-fry until cooked through but still nice and crisp-about 5 minutes. 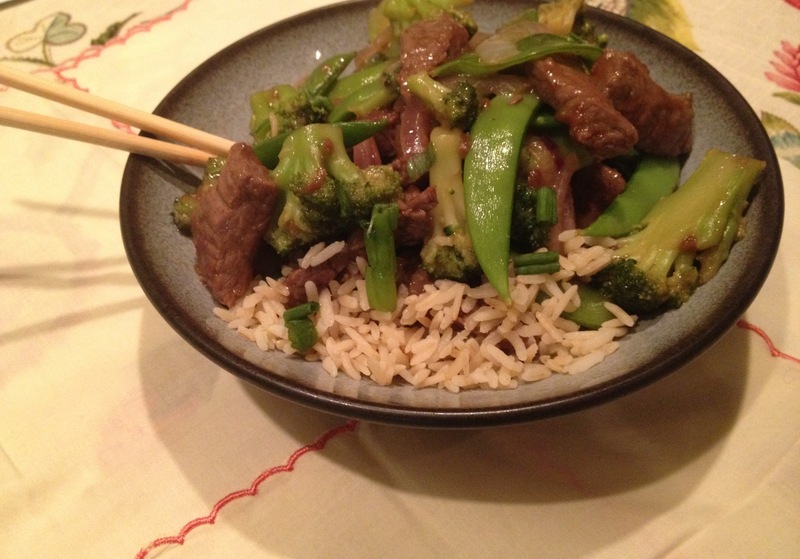 Stir in beef and remainder of hoisin sauce, cook and stir until beef and veggies are coated with sauce. Serve immediately. I served mine over jasmine rice. Makes 4 servings. Prep time: about 10 minutes. Cooking time: about 15.